It’s been over three years since we wrote about the charming Austin neighborhood of Brentwood, located in North Central Austin between Burnet Road and Lamar Boulevard to the east and west and 45th Street and Justin Lane to the south and north. This area is popular with singles and families who want to be close to Central Austin, but still within an easy commute of North Austin and beyond. Read on to find out why it's one of the best neighborhoods in Austin. Children in Brentwood attend Austin ISD schools. For pre-Kindergarten through fifth grade, that school is Brentwood Elementary. For sixth through eighth grade, children attend Lamar Middle School, which is a Fine Arts Academy. Ninth through twelfth graders go to McCallum High School, which is AISD’s Fine Arts Academy. The Texas School for the Blind and Visually Impaired is less than two miles from Brentwood. Students with visual impairments come from across the state to attend this public school. They employ teachers and a variety of staff to run the school. Brentwood is less than 15 minutes from IBM’s headquarters on North Burnet Road. IBM is one of the world’s largest manufacturers and sellers of computer hardware and software. IBM offers infrastructure, hosting and consulting services in areas ranging from mainframe computers to nanotechnology. IBM employs about 6,000 people at its Austin location, but has over 400,000 employees worldwide. As far as restaurants, Brentwood is full of them! The Frisco restaurant is an Austin institution, having been in business since 1953. They serve classic American diner food like meatloaf, deviled eggs, and more. Plus they have $2 screwdrivers, Bloody Mary’s and Mimosas all day! Barley Swine is a newer addition to Burnet Road, but is quickly becoming an Austin favorite. The restaurant focuses on a multiple course dining experience featuring fresh, in-season produce and meat from local farmers and ranchers. The menu is constantly changing based on what is available and what strikes the fancy of the chefs. Alamo Drafthouse Village on Anderson Lane is a great place to catch a movie while enjoying a drink and some tasty eats. In addition to first run films, they have special events like Sing-alongs and screenings of your favorite movies from childhood and beyond. The stretch of Burnet Road in Brentwood is seeing a lot of new apartments. One of these developments is Burnet Flats, which has apartments ranging from a 600 square foot one bedroom, one bath to a two bedroom, two bath with 1,136 square feet. Amenities include washer/dryer hook-ups, nine foot ceilings, kitchen islands, soaking tubs, and hardwood floors. The community has an elevator, garage, bike racks, sky lounge, and is near public transportation. Check out this video of their amazing rooftop deck! Amli 5350 has apartments ranging from studios with 572 square feet to two bedroom, two bathrooms with 1,220 square feet. The community has a 25-meter lap pool, fitness studio, ground floor retail, multi-level parking garage, enclosed bicycle storage, and is close to public transit. 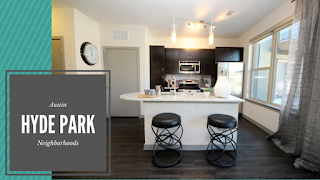 Apartments feature stainless steel kitchen appliances, granite counters, custom cabinets, kitchen islands, full size washer and dryer connections, soaking tubs, large walk-in closets, and nine or ten foot ceilings. Kensington Green apartments are located in a quiet, central neighborhood, have a pool, covered parking is available, and are pet friendly. The apartments range from 700 square foot one bedrooms to 900 square foot two bedrooms and feature gas heating and cooking, multiple flooring options, and more. Le Med apartments have units ranging from one bedrooms with 600 square feet to two bedrooms with 800 square feet. Apartments feature plank flooring, solar screens, gas cooking in select units, and more. The community has a pool with sun deck, picnic areas, a barbecue grill, and lots of parking. Ready to find your home in Brentwood? Give Austin Apartment Specialists a call today at 512-241-1111 and let us find the perfect apartment for you! The Barton Creek Greenbelt is an Austin treasure, and a great place to hike, bike, swim and just enjoy nature for people who love the outdoors. There are a lot of great apartments around this natural wonder if after watching that beautiful video you’ve decided you want to make the area around it your home. Barton Creek Landing has apartments ranging from one bedrooms with 625 square feet to two bedroom, two bathrooms with 1,048 square feet, many with Greenbelt views. Every apartment has a 42” wall-mounted flat screen HDTV, a washer and dryer, a reserved carport space, and huge windows and granite counters in the kitchen. The community has a gorgeous pool with outdoor lounging spaces, grills, an outdoor fireplace, and pet park. Apartments at Landmark at Barton Creek range from one bedrooms to two bedrooms and 523 to 1,157 square feet. All units have a patio, balcony, or private yard, feature washer/dryer connections, and have spacious floor plans. The community has a pet park, valet trash, nature trail, 24 hour fitness center, and an incredible location. The 704 has studios, one bedrooms, and two bedrooms in 39 unique floorplans ranging from 408 to 1,389 square feet so you can find exactly what you’re looking for, including live work spaces. Apartments feature open-concept kitchens with granite counters and stainless steel appliances, and bathrooms with marble counters and brushed nickel faucets. The community has lots of shops and restaurants steps from your door in its mixed-use development, a Bocce Ball court, a pool, fitness club, rooftop terrace with fire pit, and a pet park. The community is also on a Capital Metro bus stop. Ready to find your dream apartment on the Barton Creek Greenbelt? Give Austin Apartment Specialists South Austin a call today at 512-912-8000 and let’s get your new home ASAP so you can keep doing what you love! Austinites love what we do, and Drew of BoardLife Austin at Lamar Union on South Lamar is no exception. One of our agents, Eric Vidaurri, met Drew and got to take out a Boosted Board for a spin. Check out his fun journey above or here. Drew is assistant manager at BoardLife Austin, a skate shop and boutique on South Lamar. He loves being surrounded by the skate life every day, he loves the casual atmosphere, and he loves setting people up with skateboards and seeing a smile on their face. Drew and BoardLife got their fifteen minutes of fame when Casey Neistat, YouTube personality and filmmaker, headed to BoardLife when his Boosted Board crashed out at SXSW earlier this year. Then he hit the pavement to see Austin at 20 mph. Check out his wild ride. In Eric's video, he tools around Lamar Union on the Boosted Board checking out all the cool shops and restaurants in the complex. You can get pretty much anything you need just a few steps from your apartment! Start your day off right with a cup of joe from Caffe Medici, a beautiful coffee shop in the heart of Lamar Union. Their baristas will help you get your caffeine fix no matter what you desire. Lick Ice Creams prides themselves on using pure, wholesome ingredients in their artisanal ice creams. All of their milk and cream come from a local dairy and all of their ingredients are made by hand in their kitchen, resulting in a tasty frozen treat you can feel good about eating. Vox Table is a New-American style restaurant serving chef-crafted small plates that feature farm-to-table ingredients, plus an extensive handcrafted cocktail menu. Their happy hour is among the best in town where every Monday through Friday from 5 to 6:30pm you can get heavily discounted bites and booze at the bar. Alamo Drafthouse South Lamar and The Highball form an entertainment duo you can’t beat. At Alamo, check out first run flicks and fun events like sing-a-longs and showings with special meals themed to the movie being shown while enjoying your favorite beverage and a meal. Best of all, they require a silent theater and aren’t afraid to kick out patrons who don’t adhere to their no talking, no texting policy. The Highball has amazing themed private karaoke rooms, a dance floor, a stage where legends like Dale Watson hold court, and more fancy cocktails, craft draft beers, and bar snacks than you can shake a stick at. Jose Luis Salon has an outpost at Lamar Union where they offer haircuts and coloring, waxing services, and skincare treatments from facials to peels and more. The apartments in Lamar Union are pretty amazing as well. They have studios ranging from 391 to 443 square feet, one bedroom apartments ranging from 435 to 1,163 square feet, and two bedrooms ranging from 915 to 1,591 square feet. The community is on a dedicated stop on the MetroRapid #803, there is a multi-level parking garage with controlled access, two guest lounges with beautiful downtown views, a fitness center, a Yoga, Pilates, and Barre Studio, and outdoor grilling and dining areas. Apartments are designed by award-winning architect Michael Hsu, have wood-style flooring, kitchens feature 42” cabinets and quartz counters, and apartments are available with patios or balconies. 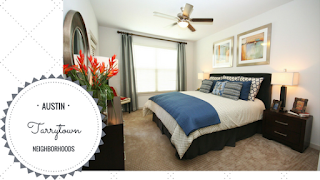 Ready to make your home in Lamar Union or nearby? Give Apartment Specialists South Austin a call today at 512-912-8000 and let’s get that new apartment so you can get back to your life in the ATX! It’s been over three years since we took a look at the Austin Neighborhood of Tarrytown, a historic, high-end neighborhood located north of Lake Austin Boulevard, east of Lake Austin, south of West 35th Street, and west of Mopac. We thought now might be a great time to see what has changed. First developed in 1934, the neighborhood is named after Tarrytown, New York and its slogan at the time was “Where Oak Trees Charm the Eye”. Tarrytown is home to many Austin landmarks like the Granger and Mayfield House, Laguna Gloria, Lions Municipal Golf Course, Reed Park, Walsh Boat Landing, and Howson Library. Residents in Tarrytown attend Austin ISD schools. For Kindergarten through fifth grade, that school is Casis Elementary. For sixth through eighth, they attend O’Henry Middle School, and for ninth through twelfth, they attend Austin High, the first public school in Texas. Tarrytown’s proximity to downtown Austin means there are a lot of employers a short distance away. Holtzman Partners are an accounting firm that offers internal audit and control services, financial statement audits, employee benefit plan audits, tax compliance and consulting services, and more and are located on the edge of Tarrytown. Hicks and Company are an environmental consulting firm that provides environmental management and planning services to public and private sector clients to make sure they comply with all applicable environmental laws, both state and national. They are located on West Fifth Street three blocks east of Mopac. Hula Hut is an Austin classic on the shores of Lake Austin serving up Tex-Mex with a Polynesian twist and an incredible view. You can even get a drink in a fishbowl! Cipollina is on the other side of Mopac from Tarrytown, but worth the short drive! It serves Italian food in a casual atmosphere and also has delicious salads and pizzas. Abel’s on the Lake is another option for food and drinks, located right next to Hula Hut. In addition to mixed drinks and over 60 beers on tap, Abel’s serves pub food with a Texas twist. They also have special events like Yomosas, where you can do Yoga and enjoy breakfast tacos and Mimosas afterwards. Tarrytown is home to many unique apartment communities so you can commute to work or play quickly. Spring Oaks has studios with 380 square feet and one bedrooms with 480 square feet and is on the UT shuttle route. There are also laundry facilities on site in this small, quaint community nestled in a residential area. Antilles has spacious apartments ranging from one bedrooms with 660 square feet to two bedrooms with 900 square feet. Bedrooms have ceiling fans and large closets and the community allows pets up to 40 pounds. The Boulevard at Town Lake has units ranging from one bedrooms with 658 square feet to two bedroom, two bathroom townhomes with 1,418 square feet. Many apartments have downtown views, private garages are available, and all apartments have a washer and dryer. The community is within walking distance of public transportation and local nightlife. Looking for your own little slice of Tarrytown in the form of a new apartment? Give Austin Apartment Specialists a call today at 512-241-1111 and let us find you the perfect place so you can get back to living life ATX style! The US Census data shows that incomes are up and poverty is down in Austin and across Central Texas, the Austin American Statesman reports. Austin’s median family income in 2015 was $76,600, up from $63,600 in 2011. Austin and Travis County’s median family incomes have increased much faster than those for Texas or the US as a whole. Across the nation, the median family income was $56,516 in 2015. 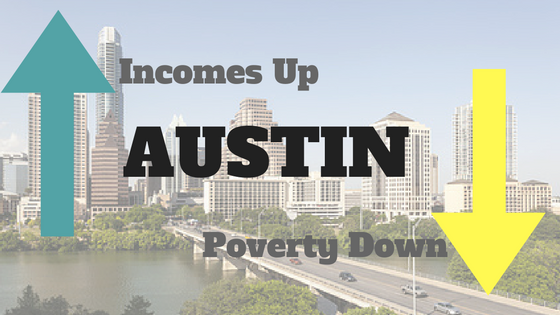 The percentage of Austinites living in poverty also decreased, from 20.3 percent in 2011 to 14.5 percent in 2015. Across the nation as a whole, 14.7 percent of Americans are living in poverty, down from 15.9 in 2015. In the towns around Austin, Bastrop saw the highest increase in median household income from 2014 to 2015. It increased over 12 percent to $75,000. Williamson county’s income increased to $89,000, a jump of 4 percent. While all this increased wealth may seem on the surface to be a success story, and anecdotal stories tell the tale of Austin residents who have been able to make a much better living than they were in the recession of several years ago, Austin city demographer Ryan Robinson cautions that all may not be as it seems. He theorizes that the rising cost of living in Austin is likely pushing poor and struggling residents out to the suburbs. Non-profits that help the most vulnerable residents in Austin echo his concerns. There is no way to know for sure from the data whether lower income Austinites are seeing their incomes increase or being pushed out of the city limits by rising rents and home prices. Whether you find yourself enjoying the rising income rates in Austin, or are looking for affordable apartments, the expert apartment locators at Austin Apartment Specialists can help. Give us a call today at 512-241-1111! Downtown Austin has changed dramatically since we profiled it over three years ago. This is a great time to revisit what makes the area between Lamar Boulevard to the West, I-35 to the East, 11th Street to the North and Lady Bird Lake to the South so popular. Downtown is home to several distinct districts, each with their own scene. Congress Avenue is one of the widest streets in town and offers a dramatic and breathtaking view of the Capitol. Sixth Street is Austin’s (in)famous entertainment district full of historic buildings converted to restaurants, bars, shops and even offices. Every weekend, Sixth Street closes to all vehicular traffic between Congress Avenue and I-35 so the tourists and locals can enjoy cheap drinks and colorful nightlife. The Second Street District, which is just north of Lady Bird Lake and is bordered by Colorado and San Antonio streets, is Austin’s high end shopping and dining district. Anchored by the W Hotel and Residences and the Moody Theater, home to Austin City Limits, this area really brings a big city feel to our little town. It’s a must-stroll around Christmas time, when several of the store windows are transformed into Holiday Displays. Rainey Street, just south of downtown and north of Lady Bird Lake, has come into its own in the last ten years. Many of the bungalows were derelict until they were redeveloped into restaurants and bars with beautiful, large patios and outdoor seating areas. The only school physically located downtown is Pease Elementary, the oldest continually operating school in Texas. This all-transfer school is popular with many people who work downtown. Downtown residents in grades Kindergarten through sixth attend nearby Matthews Elementary. Middle School students who reside downtown attend O. Henry Middle School, whose mascot is the Mustang and who is named for the famous writer and Austin resident O. Henry. Downtown students who are in grades nine through twelve attend Austin High School, located right on the edge of downtown. Austin High is over 130 years old and its mascot is Mr. Maroon. There are tons of employers downtown, including Main Street Hub, which offers an automated marketing platform that integrates social media, Web, mobile and e-mail marketing to extend local businesses' customer service, manage their online reputation and leverage Main Street Hub's merchant network. Their offices are on Congress Avenue. Umbel has a Customer Data Platform that empowers marketers to unify and access their own customer data to improve customer experiences. They are located in the old Seaholm Power Plant on Cesar Chavez. 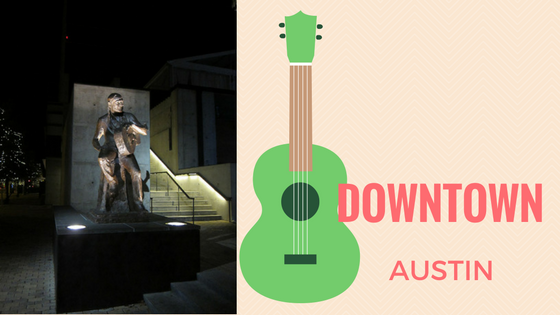 There is no shortage of things to do in downtown Austin. For entertainment, check out what’s playing at ACL Live at Moody Theater. One of the most intimate concert-going experiences in town, with practically perfect sound design, Moody Theater will spoil you for all other live music in town. Or go next door and take in an art house flick in style at the Violet Crown Cinema. They’ve got food and booze to boot! If you love beer, Craft Pride on Rainey Street features 54 taps all with Texas craft brews. For extra fun, visit for Trivia night on Tuesdays or life music on Thursdays, Saturdays, and Sundays. G’Raj Mahal, also on Rainey, has delicious Indian food in an amazing setting with both indoor and outdoor, (great for people watching), options. Koriente is located on East 7th Street, just one block west of I-35. They specialize in healthy Asian fare, including vegetarian and gluten-free options. Lamberts Barbecue is located in the 2nd street district and serves upscale barbecue in a swanky environment. They often have live music upstairs. There are a lot of apartment options downtown and more are being added all the time. AMLI Downtown is popular with those looking for a mid-rise apartment building (as opposed to a highrise), in the heart of the city. They welcome large pets, have a fitness center, and some units have downtown views. The apartments have gorgeous concrete floors and black appliances. The Beverly is located in the heart of Austin’s music district and has a free parking garage underneath. Units include washers and dryers, granite countertops and the community is very pet friendly, with a large pet park on premises. 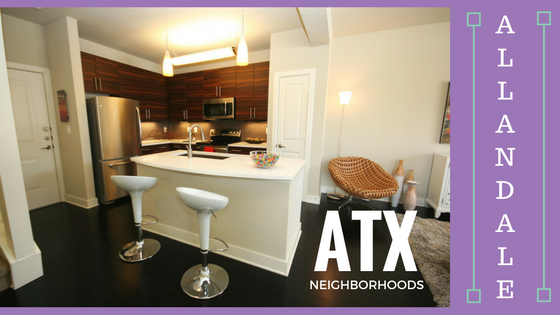 Ready to make downtown Austin your home? GIve Austin Apartment Specialists South a call today at 512-200-7535 to take advantage of our up-to-the-minute knowledge of vacancies, rent, move-in specials, and amenities at all the best apartments in downtown and beyond! We originally profiled the Austin neighborhood of Hyde Park three and a half years ago. A lot has changed since then in this charming area considered Austin’s first suburb. Hyde Park is located north of West 38th Street, south of West 51st Street, west of Duval Street and east of Guadalupe Street. It was originally marketed to affluent, prominent Austin citizens when it was established in 1891, but by the early 1900’s, advertisements for the area called for “working men and women” to purchase a lot and build a house, resulting in modestly-sized bungalows. The neighborhood has been listed on the National Historic Register of Places since 1990. Hyde Park is popular for its proximity to downtown Austin and the University of Texas, not to mention its convenience to I-35 and Mopac. It is also beloved by residents for its quiet tree-lined streets, vintage architecture, and parks such as Shipe Park. Looking for an experience that takes you back in time? Avenue B Grocery has been in Hyde Park since practically the beginning! Opened in 1909, Avenue B serves up delicious sandwiches and has a selection of groceries so you don’t have to visit a big box to get your pantry staples. The Parlor has a variety of pizza, by the pie or the slice, an impressive selection of beers on draft, wine, and a full bar. It's a great place to stop off for dinner and a pint either before or after seeing a play at Hyde Park Theatre, located just across the street. Hyde Park Theatre is a venerable Austin landmark that produces Southwest and world premieres of the best new theatre out there. They also produce FronteraFest, a five-week city-wide fringe festival that features over 800 local and national artists annually. Coldtowne Theater also provides live entertainment in the form of improv and comedy for a super cheap cover (as cheap as $5 for two acts), and is BYOB. Pick up a 6-pack of Lone Star and you’ve got an evening out for less than a movie! Residents in Hyde Park are zoned to Austin ISD schools. Students in Kindergarten through Sixth Grade have attended Lee Elementary since 1939. It is the only elementary school in the district with an auditorium large enough to fit all its students at one time, and accordingly includes a Fine Arts focus with drama, music and dance performances for all students. Kealing Middle School is home to a rigorous magnet program in addition to a standard middle school curriculum. Their mascot is the Hornets and their colors are Crimson and Cream. Kealing serves nearly 1,200 students in grades 6-8. McCallum High School is the Fine Arts Magnet for the district. In addition to regular curriculum, they offer advanced specializations in theatre, music, dance, and art. Their mascot is the Knights. For both higher education, and employment, The University of Texas at Austin is just south of Hyde Park. With 50,000 students, UT has a huge impact on the economic and cultural landscape of Austin. There are many employers in Hyde Park, and because of its convenient location, it’s a quick commute to many others. Seton Medical Center is located adjacent to Hyde Park and is Austin’s largest medical/acute care center and the only hospital in Central Texas performing heart transplants. They employ doctors, nurses and administrators in large numbers. The Texas School for the Blind and Visually Impaired is also located on the edge of Hyde Park. Students with visual impairments come from across the state to attend this public school. They employ teachers and a variety of staff to run the school. There are a lot of apartments in and around Hyde Park. The Triangle Apartments and the Lofts at the Triangle Apartments have stained concrete floors, industrial undertones in the design, and washers and dryers included in all units. The community has retail shopping on premises, is close to the UT Shuttle, and is very pet friendly. Avana has a rooftop pool, offers dry cleaning pick up and delivery, Nest thermostats, free valet trash, and free covered parking. Apartments feature white quartz counters, included washer and dryers, large walk-in closets, and more! Chimney Sweeps has large studio, one and two bedroom apartments with brick fireplaces in one and two bedroom apartments. The community has a pool, grills, onsite laundry and is conveniently located near two bus stops and dining and shopping at Central Market, Starbucks, and Amy’s Ice Cream. Ready to make the move to Hyde Park? Give Austin Apartment Specialists a call today at 512-318-2504 to take advantage of our expert knowledge of the vacancies, rents, and move-in specials at all the best apartments in Hyde Park and beyond! The Austin Business Journal’s news that Stubb’s Bar-B-Q is opening a restaurant on Burnet Lane has inspired us to revisit the Allandale neighborhood the restaurant will be tucked into. A lot has changed since we first profiled this vibrant North Central area over three years ago. Stubb’s will be located next door to Lala’s Little Nugget, a classic Austin bar that maintains Christmas decor all year long. Allandale residents love it for the authentic dive bar ambience, juke box, and no nonsense drinks. Stubb’s Bar-B-Q will share a patio with Lala’s and is all set to go ahead with their grand opening, despite an ongoing lawsuit by the company that sells their famous barbecue sauce. The lawsuit alleges that Stubb’s only has the right to have a barbecue restaurant on Red River, and any other location violates their agreement with One World Foods. Allandale is located east of Mopac, west of Burnet Road, north of 45th Street, and south of Anderson Lane. The area is popular for its highly rated schools and convenient location close to highways and public transportation. There is also a huge number of restaurants and bars packed into this area. Students in elementary school attend Gullett Elementary where they root for the Geckos. Sixth through eighth graders go to Lamar Middle School, a Fine Arts Academy with the Scotties as their mascot. The high school is McCallum. McCallum Knights come from across the district to attend McCallum’s Fine Arts Magnet Program in music, dance, theatre, or the visual arts. Allandale’s convenient location right off Mopac and 2222 and close to 183, Capital 360, and I-35 makes it an ideal location for commuting to area employers. St. David’s North Austin Medical Center is just ten minutes from Allandale and employs doctors, nurses, administrative staff and more. St. David’s was the first Health System in the state to be named “Texas Employer of the Year” by the Texas Workforce Commission. IBM’s headquarters is also less than ten minutes away on North Burnet Road. IBM is one of the world’s largest manufacturers and sellers of computer hardware and software. IBM offers infrastructure, hosting, and consulting services in areas ranging from mainframe computers to nanotechnology. IBM has about 6,000 employees in Austin and over 375,000 worldwide. As far as restaurants, Allandale is jam-packed with a huge variety of cuisines, many at the hottest restaurants in Austin. The Peached Tortilla serves Southern Comfort Food with an Asian Flare. They get high marks from diners for great service, amazing food, and delicious cocktails. Barley Swine offers a multiple course dining experience featuring fresh, in-season produce and meat from local farmers and ranchers. The menu is constantly changing based on what is available and what strikes the fancy of the chefs. Three Little Pigs is a food truck on Burnet specializing in pork. Their menu changes daily, but the pig is always the star of the show. The pork belly and Asian Fried Chicken get high marks from diners, but you should go and find out what heavenly concoction they’ve come up with today! For entertainment, Alamo Drafthouse Village on Anderson Lane is a great place to catch a movie while enjoying a drink and some tasty eats. In addition to first run films, they have special events like Sing-alongs and screenings of your favorite movies from childhood and beyond. Looking for a unique gift that has Austin written all over it? Check out Atown, home to the work of over one hundred local artists and designers. They have men and women’s apparel, beauty products, home decor, and more! There are a lot of great apartments in and around this neighborhood as well. Burnet Flats has apartments ranging from a 600 square foot one bedroom, one bath to a two bedroom, two bath with 1,136 square feet. Amenities include washer/dryer hook-ups, nine foot ceilings, kitchen islands, soaking tubs, and hardwood floors. The community has an elevator, garage, bike racks, sky lounge, and is near public transportation. Le Med has units ranging from one bedrooms with 600 square feet to two bedrooms with 800 square feet. Apartments feature plank flooring, solar screens, gas cooking in select units, and more. The community has a pool with sun deck, picnic areas, a barbecue grill, and lots of parking. 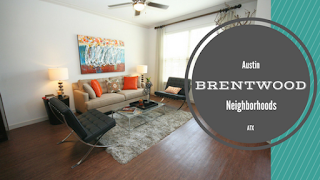 Ready to find your new apartment home in in one of the best neighborhoods in Austin, Allandale? Give Austin Apartment Specialists a call today at 512-318-2504 to partner with one of our expert apartment locators absolutely free! We know the latest in rent, vacancies, and move-in specials at apartments across Austin.